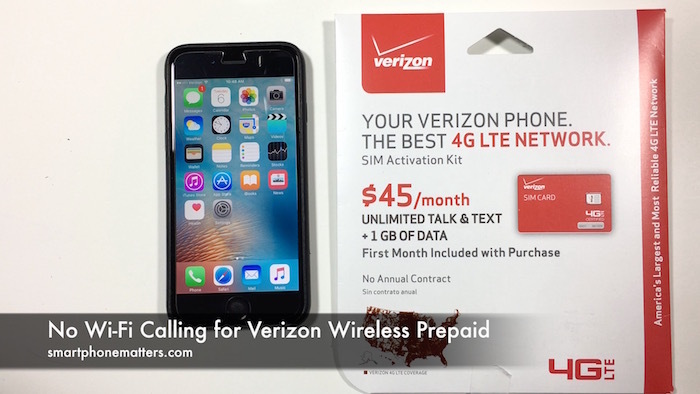 Today I decided to try and see if I could use Wi-Fi calling with my iPhone 6 and Verizon Wireless Prepaid. Wi-Fi calling lets you use your Wi-Fi network to make and receive calls in addition to using the cellular network. Wi-Fi calling can help you with calling if you live or work at a location with poor cellular reception but have access to Wi-Fi. You phone calls will be routed over the Internet instead of the cellular network. Wi-Fi calling may also help when traveling abroad because you may be able to make and receive calls in a country where you don’t have service or would need to pay expensive roaming charges. After tapping enable, a form popped up asking me to enter my address. Wi-Fi calling needs to know your location so that the network knows your location if you call for Emergency Services (dialing 911). Unfortunately, shortly after the form popped up, it disappeared and I received the the message: To allow Wi-Fi calling on this account, contact Verizon. The popup offered the option to Cancel or Visit Website. I clicked the visit website button and Safari opened to verizonwireless.com to a page about HD Voice. The page didn’t have any information on Wi-Fi calling but did say that HD voice was not offered for prepaid accounts. I did a Google search and ended up on verizonwireless.com, in the Wi-Fi calling FAQ which said that Wi-Fi calling requires HD Voice. And, that your account needs to be enabled for HD Voice and your phone needs to be compatible. The FAQ explicitly stated that Wi-Fi calling is not supported for prepaid accounts. I found it confusing that the Go To Website button took me to the HD Voice page on verizonwireless.com. It would have been clearer if it sent me to the Wi-Fi calling FAQ. So what what have me learned? Well, here is one of the differences between a prepaid and post paid Verizon Wireless account. Verizon prepaid customers do not have access to two advanced features here: HD Voice and Wi-Fi calling. For me this isn’t a big issue because I don’t need Wi-Fi calling at home, the cellular network works well enough. If you do require Wi-Fi calling Verizon prepaid may not be the right option for you.